TSWREIS (TS Gurukulams) Entrance test 2019 for Inter admissions (TSWREIS RJC CET) With and Without coaching notification applications . TSWREIS inter Admission Notification 2019 integrated coaching for IIT-JEE/EAMCET/NEET/CA-CPT/CLAT- 2019-20. Telangana Social Welfare Residential TSWREIS Admission Test for Intermediate With integrated coaching for IIT-JEE/EAMCET/NEET/CA-CPT/CLAT- 2019-20 . TSWREIS Entrance test 2019 for Inter admissions with and Without Coaching in TSWRJCs, TSWR Sainik Junior College. 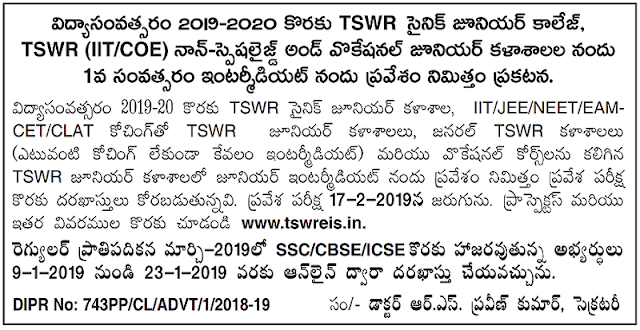 TS Social Welfare has published the TSWREIS Entrance test 2019 notification for with and without coaching in TSWR Junior Colleges and for Inter admissions in TSWR Sainik Junior College. Telangana Social Welfare Residential Colleges Admission Test Notification for the Academic Year 2019-20 in Junior Colleges of the Society all over Telangana | Online Application Form Submission at TSWREIS Official Website http://tswreis.in TSWREIS Entrance Test 2019 for Admission into Inter with Integrated Coaching,TS Social Welfare Eamcet IIT JEE Coaching Admission Test Notification, TSWREIS Admission Entrance Test 2019 http://tswreis.in/ details is as folows Applications are invited from Boys and Girls for admissions into 1st year. Applications are invited from Boys and Girls for admissions into 1st year intermediate MPC (with IITJEE/EAMCET coaching) and BPC (with NEET Coaching) and MEC/CEC (with CA-CPT, CLAT, Admission into Other Prestigious Institutions and Other competitive exams) with English as the medium of instruction for the academic year 2019-2020. The following Institutions are functioning with the above courses under the TSWREI Society. The students who are appearing for SSC Public Examination in March-2019. 1. The students who are appearing for SSC Public Examination in March-2019 and who secured up to B2 Overall Grade point and above (above 61%) in 10th class SA-I held in September/October, 2018 are eligible to apply. 2. The annual income of the parent shall not exceed Rs.2,00,000/- per annum, as certified by MRO. 3. The students of both Telugu Medium and English Medium are eligible for this entrance examination. 4. The age of the students shall not exceed 17 years as on 31.08.2019 and in case of SC students relaxation of age for 1 year will be given. 5. The students should produce Bonafide, Caste and Income certificates issued by the M.R.O. at the time of admission, then only admission will be confirmed. 1. For admissions in TSWR (IIT-Medical) Academy (Boys & Girls), Gowlidoddi, TSWR COE Karimnagar and 10 Junior Colleges, the reservation pattern is SC-75%, BC-C (SC converted to Christians) – 2%, ST-6%, BC – 12%, Minority – 3% and others 2%. 2. Among 77% seats reserved for SCs and BC-C candidates, 60% seats with be filled with the students who studied in TSWR Institutions / SW hostels and the remaining 40% filled with other SC students. 3. All the eligible BC, OC, ST and Minorities students studying in Telangana state can apply for the remaining 25% seats reserved and based on the merit these seats will be filled as per the reservation to each community. 4. 3% of overall seats will be reserved to the Physically Handicapped children in respective caste who can attend their work without anybody’s help based on the certificate issued by the Medical Board. 1. The applicant can submit his / her application through ONLINE visiting website www.tswreis.telangana.gov.in. There is no registration fee for submission of application through ONLINE from any Internet centre in the State. 2. Before filling the application through online the candidates have to read the information already uploaded in the website www.tswreis.telangana.gov.in. 3. Please upload the 100 kb photo and 50 kb signature of the student. and 2nd Screening test will be descriptive type. 2. Type of question paper will be MCQ with negative mark @ 1/4 each wrong answer. carefully otherwise the valuation cannot be done. 6. 1st Screening test Hall-ticket number stands good for the 2nd Screening test also. 7. The test will be based on the knowledge of subjects from class VIII to SSC in English / Mathematics/Biology/Physical Science/Social Studies, General Knowledge and Current affairs. 8. The entrance test question paper will be in bilingual form (i.e., in both English and Telugu Media). 9. Applicants can select any language as medium for writing the Test. Commencement of submission of Online Application: 09.01.2019. Last date for submission of applications: 23.01.2019. Date of Admission Test: 17.02.2019.